Carriers go out of their way to market family plans like crazy, but what if you just need a single line? Digging through all the details of every carrier can be a challenge, but we’re here to help with that. Of course, it’s not as simple as “here is your plan, now go buy it.” In fact, the right cell plan is incredibly subjective—whats right for me, may not be a good fit for your lifestyle at all. 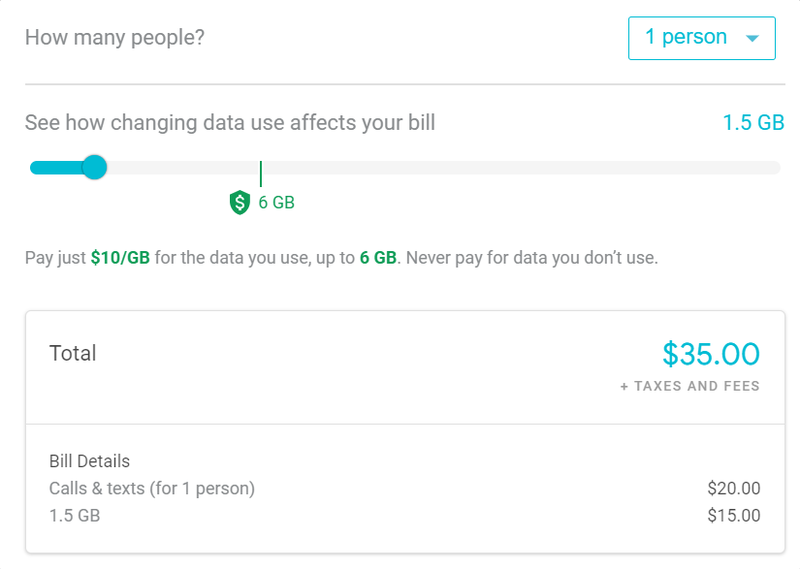 There’s a lot to take into consideration here, like monthly data usage, the type of data you use, and of course, how much you’re willing to pay. Do you want to avoid overages at all costs and don’t mind slow speeds once you’ve used up all your data? Or would you rather shell out more money and go with an unlimited plan? These are some of the things you’ll need to think about when searching for a data plan. Fortunately, there are more choices than ever before (which is also what makes finding the right one such a challenge) and carriers are offering more features per plan. For example, some carriers will let you stream Netflix or YouTube without using any of your data. 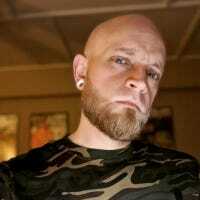 Others will do the same for streaming audio, like Pandora or Spotify. If there’s one thing that can chew through your data quicker than anything else, it’s video. Doesn’t matter if it’s coming from YouTube, Netflix, Hulu, or somewhere else—this is easily the biggest data hog on the internet. If you stream a lot of video, you’re going to want to focus on plans that won’t hinder your usage. 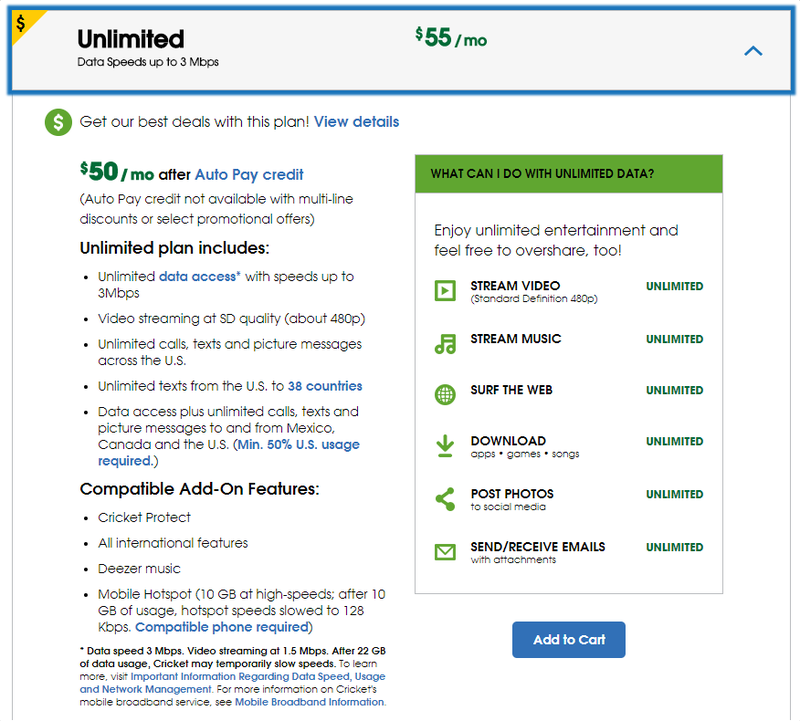 It’s not quite as simple as just going with an unlimited plan, however, because most plans that are supposedly “unlimited” still end up limiting your video steaming somehow—like limiting it to 480p, for example. That’s why so many carriers offer two tiers of “unlimited” data: one with some limits, and one with more limits—which generally applies to streaming video more than anything else. So when it comes to getting the most data and the best video quality for the least amount of money, there are two carriers that stand above the rest: Cricket and Sprint. 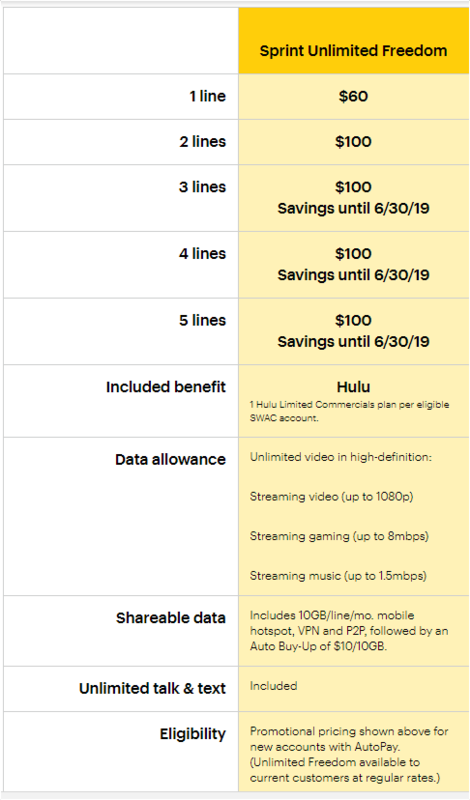 Both Cricket’s Unlimited Max plan and Sprint’s Unlimited Freedom plan offer unlimited data packages that also include unlimited 1080p video streaming for less money than the competition. Sprint’s plan will set you back $60 a month (including the AutoPay discount), while Cricket’s is $55 (with AutoPay). There are two primary differences between these two plans: coverage and speed. Cricket is owned by AT&T and uses the same network, so it has outstanding coverage; Sprint’s coverage has gotten better over the years, but it’s still not quite as good. That said, Cricket’s speeds are also limited to 8Mbps, regardless of time, day, or the amount of data you’ve used—-that’s the fastest it will ever be. Sprint, on the other hand, will be much faster in areas with good coverage, which is something that you’ll need to consider. That said, I’ve personally been a Cricket user for nearly two years, and I have yet to find a scenario where 8Mbps was too slow for my data needs. Note: Both carriers may throttle your speeds “during peak usage” after a certain amount of usage, generally around 22GB. If you’re just interested in unlimited data and don’t watch a lot of streaming video (or don’t mind if the quality isn’t HD), then you have a different set of options available. Sprint’s Unlimited Freedom plan is still a good choice here—it offers unlimted data, 1080p video, and 10GB of mobile hotspot data, so if you live in an area with good Sprint coverage, this may be the one for you. The same can be said of Cricket’s Unlimited Max plan. 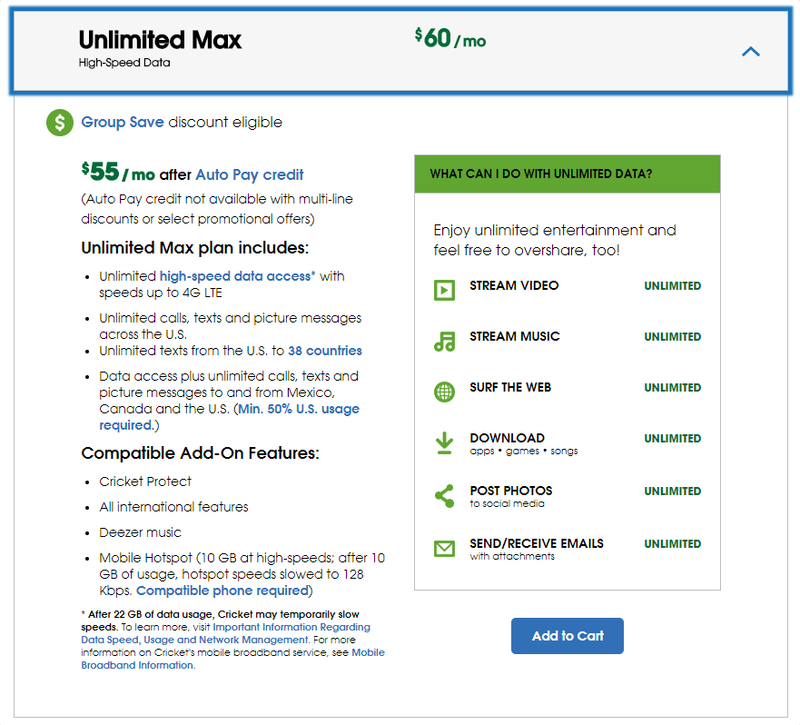 However, if you’re not as concerned with high quality video, you can save yourself a little coin by looking at Cricket’s Unlimited plan (not to be confused with Unlimited Max, which is different). It limits video streams to 480p (standard definition), but everything else is unlimited—though speeds are also throttled to 3Mbps instead of the normal 8Mbps. It’ll save you $5 a month, bringing this one down to $50 a month with AutoPay. That’s about as solid of a deal as you’re going to get on an unlimited plan. While Cricket is owned by AT&T, its parent company also has a solid unlimited plan offering in Unlimited Choice. This plan is nearly identical to Cricket’s plan (thought it’s $15 more), but that cost can be offset if you’re also a DirecTV Now subscriber. Since AT&T also owns DirecTV, it offers $15 off a DirecTV Now plan with an AT&T Unlimited plan. So at that point the price difference compared to Cricket becomes a wash. But there’s also another benefit to choose AT&T or Sprint over Cricket: the best phones with carrier financing. Cricket does sell its own phones and sometimes offers deals on new lines, but there’s one catch: no financing. If you want to buy a phone from Cricket, you’ll be shelling out whatever the cost of the phone is up front. AT&T and Sprint both offer in-house financing options, so instead of paying $999 for that brand new iPhone X, you can break it down into 30 equal, monthly payments. For the homebodies and hotspot surfers, there are some really good options. Again, we’re looking to Cricket to start—for just $30 a month, you can get 2GB of data and unlimited talk/test. It also offers a 5GB plan for $40 a month. Easy peasy. But if you’re in the “I don’t know how much data I’m going to use” camp, then you may also want to look at Project Fi. This is an interested taking on a cellular plan, because you only pay for what you use. 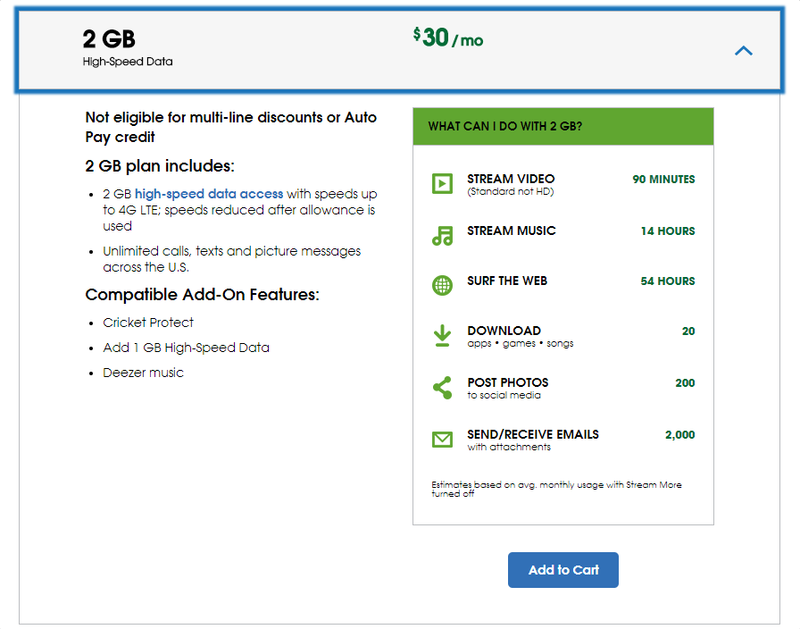 It’s $20 for a base plan, then $10 per GB. So if you only use 1GB, you’ll be looking at $30. The cool thing about Fi is that once you hit 6GB, all data past that is “free.” That means the most you’ll pay for a single line is $60, regardless of how much data you really use. That’s great if you happen to have a big month when a traditional plan would end up hindering your usage. 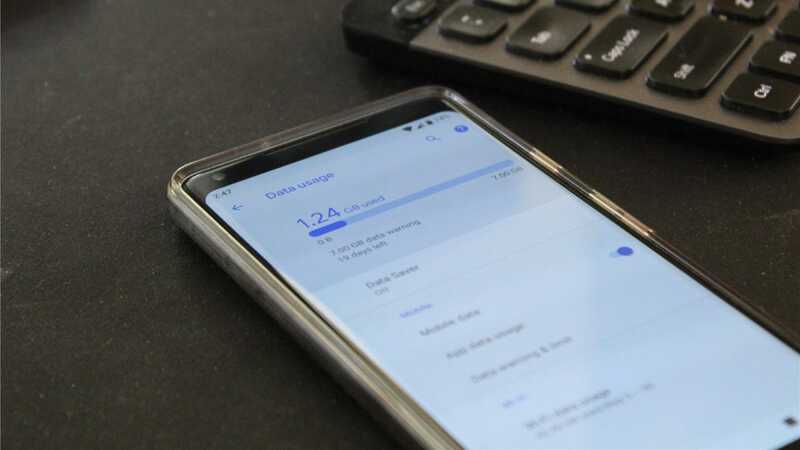 The biggest drawback to Project Fi, however, is that it only works with a very specific set of phones: Google Pixel/XL, Pixel 2/XL, Moto G6, Android One Moto x4, LG G7 ThinQ, and LG V35 ThinQ. You’ll notice thing here: a distinct lack of iPhone support. If you like to live on that side of the fence, Project Fi is not the carrier for you—Cricket is definitely the way to go. If you want to get music in every room in your home, there are a lot of ways to go about it, but the best value in terms of cost, setup, and ease of use is clear. Sonos is the king of the whole house market.